Saxophones , in comparison to many other instruments, do not have a very long history. The first one was designed around 1840 by a Belgian named Adolphe Sax in an attempt to improve the sound of the clarinet. Adolphe planned the saxophones as a family of instruments ranging in size from the sopranino, soprano, alto, tenor, baritone, bass, contrabass, and sub-contrabass. 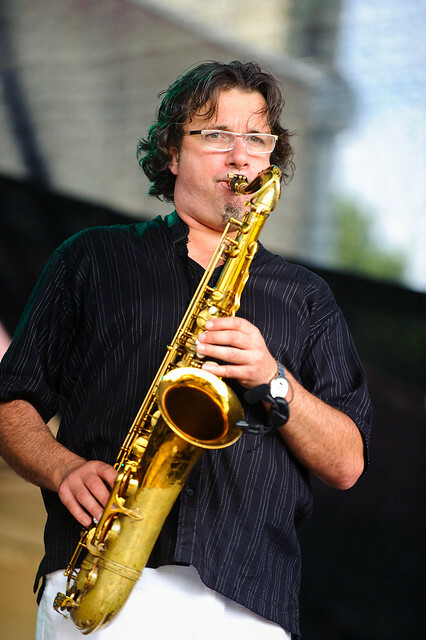 Saxophones were first introduced into a musical score in 1844 by Jean-George Kastner. Saxophones were initially used in symphonies, military bands, and chamber music, then in big bands, and in the 1920's saxophones were incorporated into jazz music. Jazz music began it's infiltration into American music in March 1917. The principal instruments used included the trumpet, cornet, slide trombone, valve trombone, French horn, baritone, clarinet, family of saxophones, percussion, string bass, and piano. When members of the Original Dixieland Jazz Band were recording their music in a New York studio, they were instructed to play faster in order to fit the whole song on a record. This exciting, lively, assertive, rowdy, and bold music is what caught the attention of everyone's listening ears. It was a time when America was hard at work and needed an outlet, a way to play. They grasped this new style with full force and made jazz a favorite pastime. Although this seemed like new music, it was not totally new in the truest sense of the word. It involves taking apart an already established song and then putting it back together in a novel way. Jazz also involves, to a large extent, the component of improvisation in order to interpret the melody or harmony in a fresh way. Playing jazz involves elements of spontaneity, spirit, creativity, and rhythmic drive. As stated by Gary Giddins, "It's the ultimate in rugged individualism. It's going out there on that stage and saying: It doesn't matter how anybody else did it. This is the way I'm going to do it." Jazz allows the expression of a full range of emotions with whichever instrument the musician is using. Clearly, one of the most expressive instruments in this type of music are saxophones with their ability to squeal, laugh, shriek, and whisper. Saxophones are able to release the inner voice, the feelings, the inner personality of the musician playing them. Not only is jazz music an outlet for those listening to it, but also for the musicians playing the music with their saxophones. Certainly what wasn't able to be said in words was often verbalized musically whether through a soulful lament or a happy energetic, playful sound, especially with the tenor, alto, or soprano saxophones. This means of expression is portrayed in the music of not only the early innovators of swing, but also in bebop, hard bop, jazz, free jazz, and electric jazz/rock/funk. Some of the best and most renowned music came from those musicians with the most difficult inner personal conflicts. It seems though that those with the most troubled lives had the most inner drive to make their music as brilliant as possible. This author is a saxophonist, novice pianist, and novice guitarist. In addition, she is an occupational therapist who works with a host of disabilities utilizing sensory integration and neurodevelopmental therapy in combination with music and a variety of other techniques to assist these persons in achieving the highest level of function and quality of life possible.